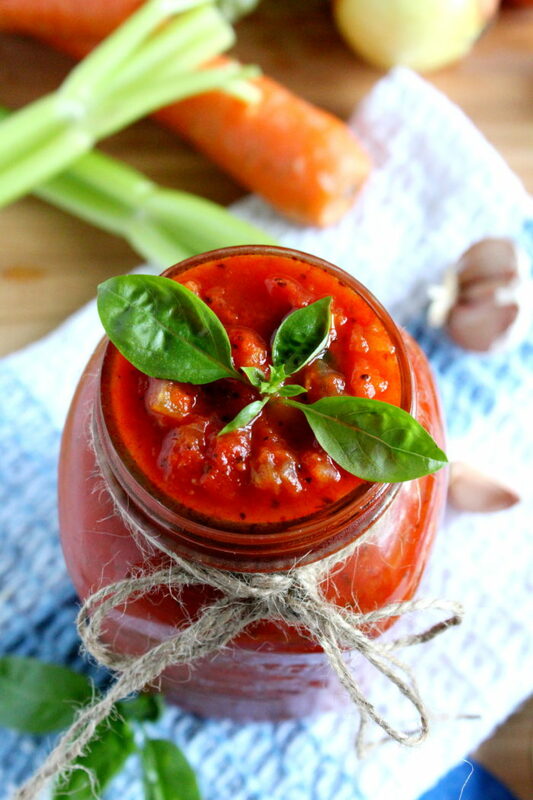 A simple and Easy Marinara Sauce made with good quality San Marzano canned tomatoes. Canned tomatoes make a delicious Easy Marinara Sauce. 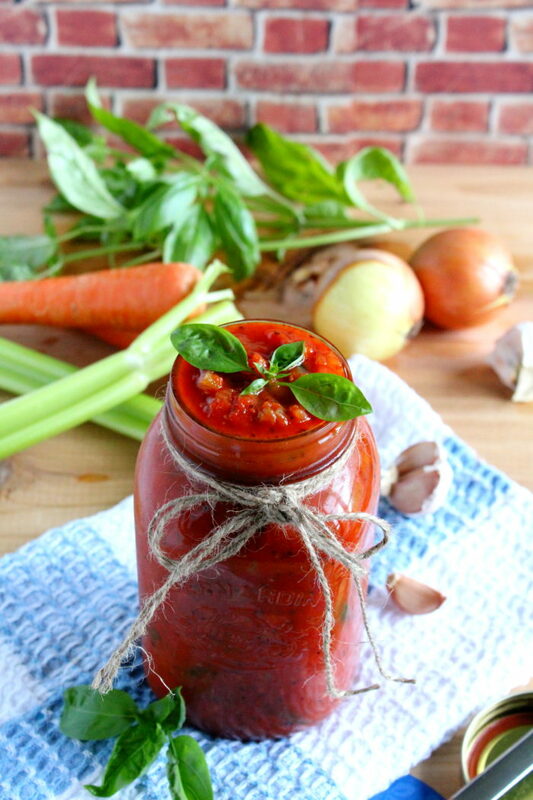 The key to making this super easy tomato sauce is good quality San Marzano tomatoes as well as the best and freshest onions, celery, carrots and garlic. You will be rewarded with the most sensational aromas and intense flavors of a great simple sauce. Basil is one of my absolute favorite herb and I love to use both the dry and fresh basil in my tomato sauce. The dried variety is great for a long simmering pasta sauce as it has time to infuse the dish with its sweet scent. When I have an abundance of fresh basil I will add a couple of springs during the simmering time then fish it out and finish the sauce with an additional layer of shredded basil just before serving. This recipe is so versatile, one I turn to when making my Chicken Parmesan with Kale or serving it alongside my Arancini. It is also my go to recipe for simmering melt in your mouth meatballs. Taking the time to sauté the onions until they are translucent ensures a sauce full of flavor. It would also be wonderful over gnocchi or use it in your favorite baked pasta dishes. Add a pinch or two of hot chili flakes while it is simmering and use it as a spicy dipping sauce. This recipe makes enough to fill 2 mason jars. It can be refrigerated it for up to 5 days or can be frozen for later use. Pour the olive oil in a sauce pot and stir in the chopped carrots, celery, onions and minced garlic. Add a pinch or two of salt and pepper. Pour in the crushed tomatoes. Fill the tomato cans with 3/4 full of water, give it a good swirl to release any tomato bits resting at the bottom of the can and add this to the pot. Stir in the dry basil and the 2 basil sprigs, salt and pepper. Turn up the heat, cover and bring your sauce up to a boil, stirring and checking frequently. Once you have an active boil, reduce the heat to low and let the sauce simmer covered for 1 hour stirring occasionally. At this point the sauce should have thickened and reduced by a quarter. If not, simply remove the lid, turn up the heat a little and let it cook for a half hour longer. When it becomes concentrated enough, you will know it is ready. Just before serving fish out the two sprigs of basil and add in the additional 1/2 cup shredded basil. Taste the sauce and add more salt if needed. I looooove trying new tomato sauces and the extra vegetables in this one are winners, in my opinion! Yes, a wonderful way of adding some bite to a sauce. I’m going to do this! Thanks for the recipe! ? Totally trying this!! Thank you! Hi Marisa – thanks for dropping by My Yellow Farmhouse today! I’m so glad that I found your recipe for a good – and easy – marinara sauce. I’m ‘pinning’ it for sure!! Forgot to say – I LOVE your presentation and your photos!!!!!!!!!!!!!! !